Corporate treasurers demand better payments services. They want banks to process their payments quickly and efficiently, in their preferred formats. And they seek a consistent experience, whatever the payment source or destination. Most banks can’t deliver. The biggest barrier to effective corporate onboarding is dealing with proprietary payment file requirements, and delivering an integrated customer experience across payment types and channels. 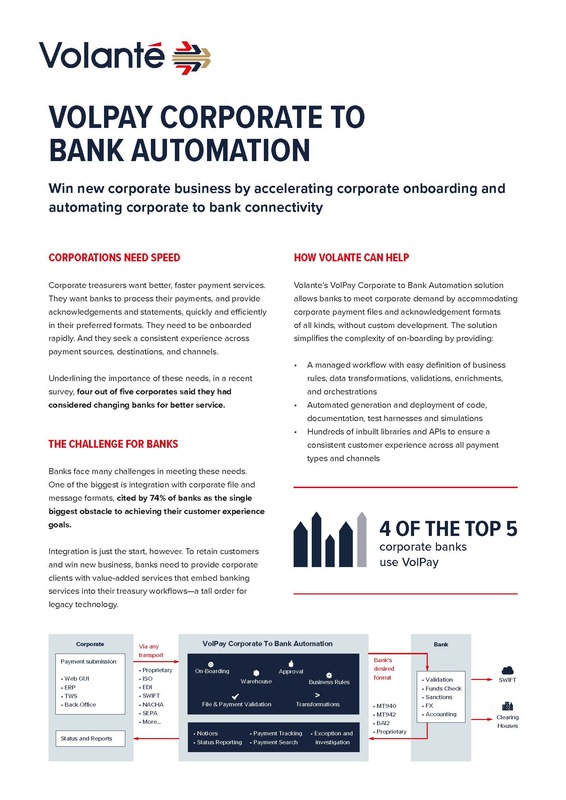 VolPay Corporate To Bank Automation allows banks to handle complex corporate payment file requirements without custom development, automating the payables process and speeding onboarding. Read the executive briefings to understand why automating corporate payables processing is an ideal opportunity for banks to differentiate and win new business in a competitive marketplace. A solution for rapidly accommodating corporate payment files and acknowledgement formats of all kinds, without custom development. Powered by hundreds of inbuilt libraries and APIs to ensure a consistent corporate customer experience across all payment types and channels. Listen to Volante’s Nadish Lad talk about the challenges of corporate onboarding, and approaches to solving them.